Download the 2016 HLC Self Study Report. The following business programs at the University of Northwestern Ohio are accredited by the Accreditation Council for Business Schools and Programs (ACBSP): Business Administration with concentrations in Agribusiness Management, Automotive Management/Automotive Aftermarket, and Marketing (BS); Master of Business Administration (MBA); and Business Administration (AAB). *Students listed in the 2016 year are still enrolled in the program and have yet to graduate. Their outcomes will be updated upon graduation date. The Health Information Technology Program is accredited by the Commission on Accreditation of Health Informatics and Information Management Education (CAHIIM). 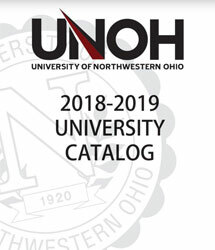 The University of Northwestern Ohio is approved for participation in the State Authorization Reciprocity Agreement (SARA) by the Ohio Department of Higher Education. NC-SARA is a multi-state consortium that establishes comparable national standards for interstate offering of postsecondary distance education courses and programs. For more information about the SARA initiative and the progress of state and institutional membership, please visit http://nc-sara.org/sara-states-institutions. For a complete listing of memberships, click here.